Mark talks about popular food in New Zealand. Todd: So, Mark, when people think of Americans they often think of the hot dog and when they think of Japan they think of sushi. What are the foods that people associate with New Zealand? Mark: According to a lot of the Japanese students that I know who have gone to study in New Zealand or have a home stay programme over there, they normally come back speaking about 3New Zealand foods. The first one is probably fish and chips, which is a traditional or unofficial traditional Friday night meal. At the end of a long week mum and dad will say, “Lets go and get some ‘greezies’”: deep fried battered fish, potato fritters or hot dogs and fried chips. They used to be wrapped in newspaper but now for health reasons you’ve got to have plain white paper. Mark: Yeah, but the fish and chips dinner on Friday night is a bit of a tradition. Todd: Oh, ok what else besides fish and chips? Mark: The other one would be something called a pavlova which is similar to a large meringue cake, very rich, very very sweet, made with egg white and lots of sugar with lots of whipped cream and fresh fruit on top. Kiwis and Australians often argue over who invented it but I’m sure kiwis did! Todd: Pavlova, uh?Is this like a snack you eat in the afternoon? Mark: No, it’s a dessert, it’s the size of a cake. It would be a dessert cake. Todd: Is this something people make themselves or buy in the store? Mark: The best ones I think are home made. The third food is vegemite, which is a breakfast spread, a yeast based breakfast spread. Lots of non-New Zealanders who don’t know it think that it looks like chocolate spread, and then they put in on their toast or bread in the morning, but it actually has a very unique taste and it’s nothing at all like chocolate! Todd: So is it bitter? Is it sweet? Is it sour? Mark: It’s got a very yeasty flavour but its quite hard to describe, but its another one of those New Zealand traditions. Todd: You say its made from yeast so what are the main ingredients? Mark: It’s a yeast based extract so its very healthy for you: lots of minerals, and all kiwi kids should grow up on it. Todd: Ok, sounds interesting – I’ll have to give it a try. 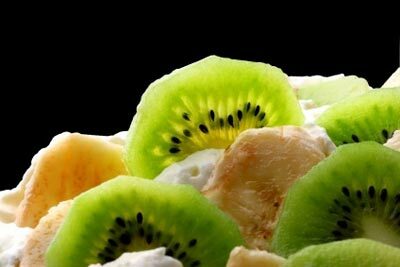 What are the foods that people associate with New Zealand? I associate the smell of roses with my grandmother's house. Tacos and tequila are associated with Mexico. According to a lot of the Japanese students that I know who have gone to study in New Zealand or have a home stay programme over there. He was enrolled in a home stay programme in Germany so he had to speak German at home. A home stay programme is the best way to learn about another culture. They used to be wrapped in newspaper. The baby was wrapped in a blue blanket. My birthday present was wrapped in shiny gold paper. Is this like a snack you eat in the afternoon? Chips are not a healthy snack food. She brought an apple for a snack on the long bus ride. It’s a yeast based extract so its very healthy for you. The bread was made with almond extract and had a sweet taste of nuts. The mint extract burned inside my nose when I smelled the bottle.